LAEP's Speaker Series is a fantastic opportunity to learn about the design of places and systems that shape our world. Anyone interested in how his or her life and career might be enhanced through learning about planning and design will enjoy attending. Students from Art, Graphic Design, Performance Art, Engineering, Landscape Architecture and Environmental Planning, and Outdoor Product Development and Design are likely to be enlightened by this series. Speakers include leaders in design professions who are making a difference. They are encouraged to answer the questions: “How am I, and the work I do, relevant?” The intent is that through these 40- minute talks, speakers will reveal problem-solving approaches in the creative process. Through visual examples of their own work, they share how this is accomplished. The goal of the LAEP Speaker Series is to make the content of the presentations reveal problem-solving methods and the attitudes that support collaborative behavior. The underlying premise is that these qualities can be taught, and that seeing the results in the practice of designers is very beneficial to students and practitioners. Designated Fridays throughout the academic year. 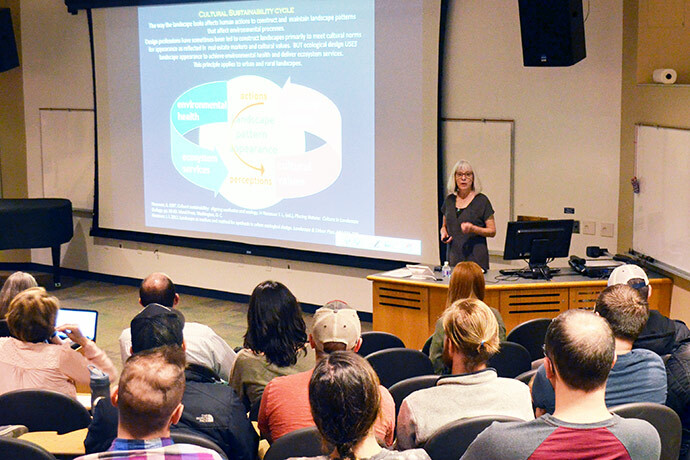 To make Speaker Series acessible to all, the talks are recorded by Utah State's Media Production Department. All talks can be viewed online and previous speakers will be listed below.